You love animal noises. You make almost every sound in the animal kingdom and even try a flamingo sound when we read Polar Bear, Polar Bear . You lift your little leg and flap your "wings." We have roared on airplanes, quacked in restaurants, and generally make it easy for people to stare, and you love the attention! 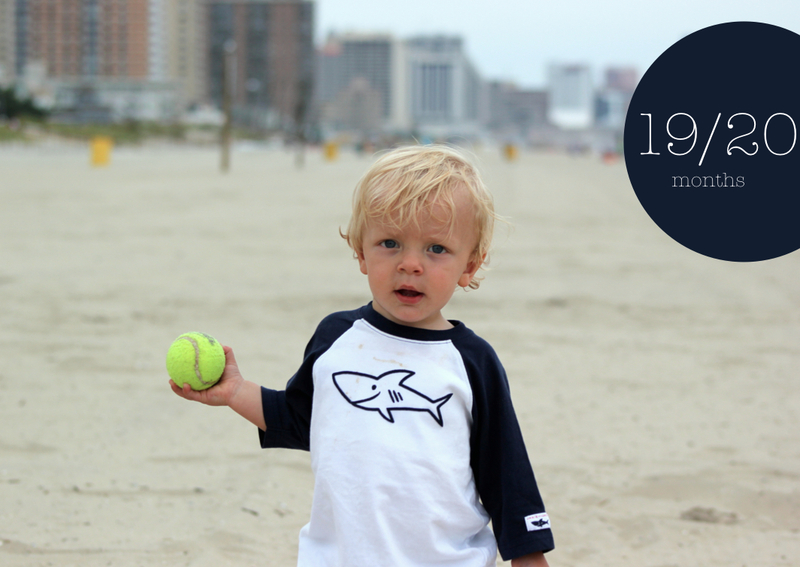 If these months had a theme, it would be the beach (see more pictures here and here). You love the beach, despite initial apprehension, splashing in the water, throwing seashells like you are skipping rocks, filling up your pail and dumping it all back out again. And the calming ocean waves have lulled you into some of your sweetest, most tender naps, the ones where you still curl up on our laps and nuzzle your head into our necks. Thank you for these moments. You rely on your new independence these days, being able to do most things without help. But in the same beat, you also will reach up to hold our hand. Knocking things over has a new joy when you get to exclaim, "oh, no!" Block tower collapses, "oh, no!" Cup tips over, "oh, no!" Water splashes out of the bathtub, "oh, no!" It is your ticket to naughtiness, and you know it! Behr, you have us jumping. We are constantly in ready mode, anticipating you next act, and we are loving every minute. We love you so much! Behr is wearing a Janie and Jack shirt with hand-me-down Gap swim trunks. More pictures of Behr's outfit can be found here. What a fun age and such a sweet letter! Behr looks adorable in his picture! I love letters like these. I need to write them too because I know that even if the kids don't appreciate them, I will!